A passionate love story about two very different individuals coming together in a dangerous time, Cold War is a beautiful piece of art that perfectly captures the sights, sounds and sentiments of living in 1950s Eastern Europe. Following the story of music director Wiktor (Tomasz Kot) and aspiring singer Zula (Joanna Kulig), the film spans just over a decade of the two falling in love and back out again as they become famous in artistic circles in Poland and Paris. Shot completely in black and white, the film has a very noir feel to it. 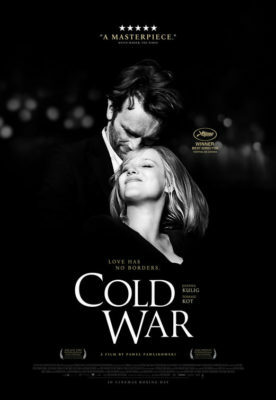 While slow at times and a tad bit depressing given the backdrop of communist Europe, Cold War is still a wonderful story of two unlikely people falling in love. For fans of period films and more importantly, period music, the film is a must watch. As much as Cold War is about Wiktor and Zula’s intimate love story, it is also a wonderful showcase of Polish folk music. While the musical score is nothing like what you’d hear in most modern movies, respect must be given to the director and production crew for faithfully recreating sounds that likely haven’t been heard for over forty years.